Festival day, Fort Portal. Eight schools: six primary, two high schools. While a fiercely competitive primary tournament raged behind us, Alpha and I oversaw the high school matches. And there was a bit of David and Goliath about it. Nyakasura High School are the western region cricket champions and currently 3rd nationally for both boys and girls. Kyebambe High School is an all-girls school reputedly (both from their own PE teacher and today’s opposition) focused on books not sport. It is certainly fair to say they are not in the running for the national cricket champs. But today the Kyebambe all-girls team played a mixed team from Nyakasura. During their 3 matches, my role as scoring tutor allowed me to chat to people on the side-line. Paul, the PE and fine arts teacher at Kyebambe is seemingly cricket mad. It turns out he was schooled at Nyakasura, where he was first introduced to the game. He brought his two young daughters to coach education day, and he is clearly trying to pass on his cricket enthusiasm to both of them. So much so, his top choice of high school for both of them seems to be largely based on its cricket reputation! However, Paul’s desire to spread enthusiasm for the game does not stop at his family. He was desperate his students wanted the girls to carry on playing. He asked us to talk to them, hoping we would inspire them to carry on playing, despite the schools sharp focus on academia. Feeling somewhat on the spot and unconvinced I was the inspirational female role model they were looking for, I explained that I had both managed to get an education and play cricket. I also told them the benefits cricket provided me; friends, health, adventure amongst others…I guess the fact they turned up to the festival today, means I didn’t put them off completely! Kyebambe is a boarding school. They look after the health of the girls with education and counselling, but also have visiting medics. These visitors carry out obligatory pregnancy tests. If you are pregnant you are out. The school does not believe it can teach pregnant girls. Paul noted this was a shame, as sometimes those who fall pregnant are promising. They also have blood transfusion teams that visit the school for blood donations, and this team offers the gives optional HIV tests at the same time. The school has positive students, which they support to manage their disease with the school nurses and dispensary. Stigma is a big deal at the school, statuses are very private, with only a few key teachers knowing who is positive. Patrick, a 16-year-old at Nyakasura, and some of his school mates joined me for a stint on the scoring. 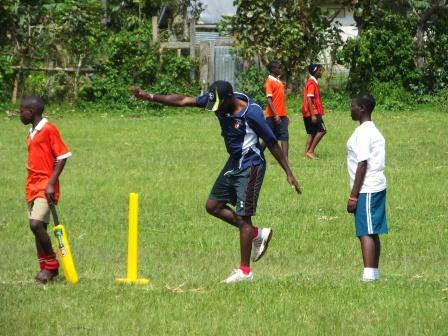 They all hoped cricket was an important part of their future, some of them hoping to play for the national team, while others want to emulate our Ugandan coaches, Ronnie and Alpha, and find employment through cricket. The school seems big on HIV education. They have an abstinence club. There is peer education within the school. And in fact students of the school carry out community education about HIV. Condoms are different. These are banned in school. I assume the party line being abstinence is king, probably a reasonable for a mixed boarding school. Though, I can’t help thinking that a ban on condoms does sit slightly uncomfortably with the ABC’s. 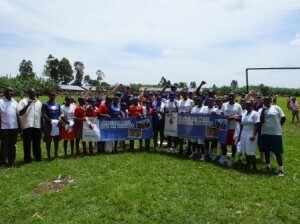 Back on the cricket pitch Nyakasura were crowned champions, but with each match played Kyebambe improved; going from a pummelling in the first match, to a tight final game. As Patrick, noted, if there had been a fourth match, Kyebambe had a very good chance of winning. Promising stuff! Previous postHIV and Uganda: mixed messages?